The Great Coffee Maker Debacle revisited. 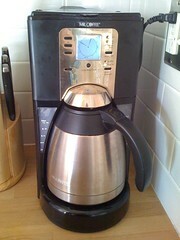 This is our coffee maker. We like it a lot, because it has a thermal carafe that keeps the coffee warm for hours without burning it down to a toxic black sludge. The only drawback is that the carafe can cool the coffee down with its cold stainless steel sides, unless you fill it up with hot water first, let it sit for awhile, then dump it out before brewing the coffee. Back in January, I wrote in my blog about what happens when you forget to dump out that hot water before pressing the “Brew Now,” button on the coffee maker – a big puddle of coffee water all over the counter and the floor. So the other day, Chris called me while I was at work and left a message, “I fail at mornings.” When I called him back, he said, “Remember that time you forgot to empty the carafe before brewing coffee?” Yeah. It happened again. Only this time, he didn’t catch it until the whole pot had finished brewing. After he cleaned up the mess, he looked at the coffee maker and saw that the water had gotten into the electronics portion of it and screwed up the clock and probably the control buttons. Then, he set to taking apart the coffee maker to see if he could let the electronics dry out. So we had a partially disassembled coffee maker sitting out on the counter for a few days, and our schedules failed to coordinate, so we didn’t get around to shopping for a new one. Then, yesterday, he decided to try putting everything back together. Reassembled and plugged in, the coffee maker worked! The clock was screwed up, but the important “Brew Now” button lit up when pressed. And thus, this story illustrates one of the most important lessons I have learned from Chris: if electronic things get wet, take them apart as much as possible and let them dry out. They will probably work later. If you try to use them when they’re wet, you’ll just short them out. Our coffee maker’s gonna be just fine. 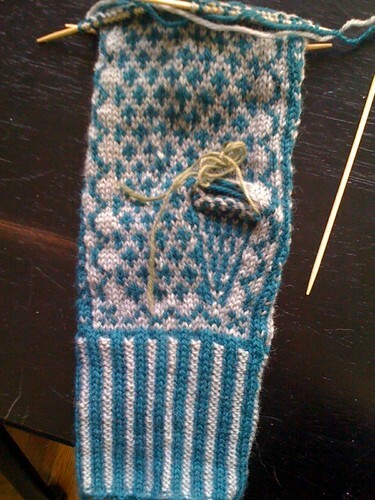 In knitting news: I’m making progress on the first mitten. See? My tension is uneven all over the place, and I’ve got funky lines at the corners of the double pointed needles, but I’m pretty happy. It is my first stranded colorwork this complicated, so I don’t expect it to be perfect. Now that I’m conscious that the yarn “cuts corners” where the dpns meet, I’ve been making sure to straighten out the corners and let the float be a little longer over those corners. However, that issue may be enough motivation for me to learn how to knit in the round on two circulars. 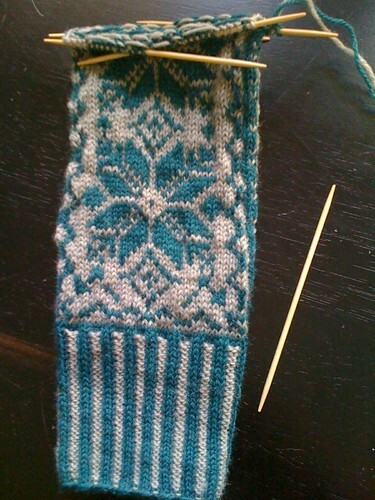 Which is pretty crazy, because I actually really like knitting on dpns.